13 Sep 2018 --- With consumers increasingly scrutinizing the provenance and health benefits of the products they consume, naturally-derived antioxidants have become the “it” health ingredient to look for in food. However, researchers from UBC Okanagan and the University of Bologna have discovered that TEMPO – a well-known artificial antioxidant – is up to 100 times more powerful than nature's best and could help counteract everything from skin damage to Alzheimer's Disease. While the body already has its chemical defenses against free radicals through vitamin C and vitamin E, DiLabio and his colleagues wanted to know how a human-made antioxidant called TEMPO would perform. The researchers found that TEMPO was up to 100 times faster at converting free radicals than vitamin E in fatty environments. 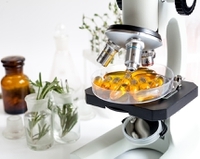 “That means that it could be a particularly effective means of protecting skin tissues or even the walls of cells from radical damage,” says DiLabio, adding that the study may lead to the development of a pharmaceutical therapy to help prevent free radical damage. “I could see this leading to the development of a topical cream to protect your skin after exposure to the sun or even a pill that could protect your neurons from getting damaged. The possibilities are very exciting,” he concludes.